During the inter-war period of the 1920s, a Canadian-American inventor sought to revolutionize the infantry weapons of the era. He decided that the traditional bolt action, while widely accepted and very effective, proved to be insufficient in contrast to the machine guns of WWI. There were a multitude of self-loading rifles already in use across the world, and while many were successful, they were incredibly difficult to mass-produce. However, once Garand was employed at Springfield Armory, he was in the perfect position to create arguably the most iconic rifle ever. With his previous job at Brown & Sharpe, he already had experience as a machine tool designer. With the backing of Springfield and his previous experience in the industry, along with some good old (Canadian) American ingenuity and determination, he successfully created the world's first successful, mass-produced, self-loading rifle. 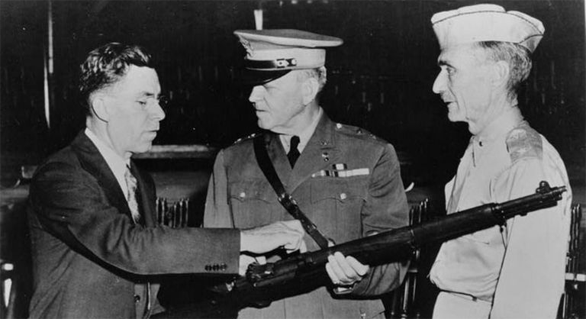 Throughout the 1920s and 1930s, John Garand continued to put his .30 gas-operated rifle on trial for the U.S. Army. One major competitor was the .276 Pederson rifle. The competition failed to deter John, and after many years of modifications, his design finally won. In particular, Gen. Macarthur liked the .30 design since the round was already in surplus. Garand went on to help Springfield create the necessary tools to produce the rifle. The weapon went on to become the poster child of the American military for many decades until it was phased out in favor of the M14. However, the impact it had was undeniable: when the M1 was issued, it mainly went up against bolt-action rifles with 5-round clips. The 8 round capacity and semi-automatic capabilities of the rifle allowed the individual soldier to put down much more fire than his enemies. Rising Storm is the only game in the 29th where the M1 can be used. In the game, the M1 is one of two options for the U.S. rifleman class. Overall, the weapon is far better than the other rifles within the game; those who use it absolutely love it, citing that the extra rounds and firepower are more than worth the few downsides that it has. One massive downside to this rifle is its recoil, which is a lot more than the bolt-action rifles of the game. This makes the rifle require a bit more marksmanship. The other downside of this rifle is the 'ping'. This signature sound is created when the final round is fired and the en bloc clip is ejected out of the top of the weapon. This sound is known to almost all sides, and signals to the enemy when the soldier is out of rounds and needs to reload, giving them a slight edge in combat. The final downside to this rifle is the loss of power at range. In-game, the M1 has a much shorter operational range than the bolt-action rifles, which can create problems when engaging at a distance. Despite the recoil and the 'ping', those who use the M1 absolutely swear by it and say that the ability for a single squad of troops to put down enough fire to suppress a much larger force makes this weapon a mainstay. It certainly has earned its reputation through history, and through its use here in the 29th. If you need to put down a lot of fire, take down a large group of enemy soldiers, or simply want to feel like a true G.I., look no further than the fantastic M1 Garand. Just don't catch that Garand Thumb! 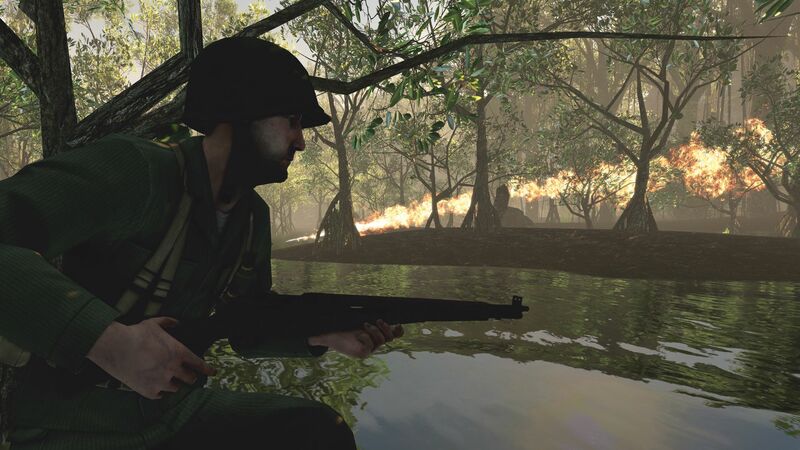 It is now also available in Rising Storm 2: Vietnam, specifically in maps where you play as ARVN rifleman or marksman.